Data-Driven Decision Making signifies individuals who acquire knowledge to maintain performance, implement improvements, and evaluate process changes. 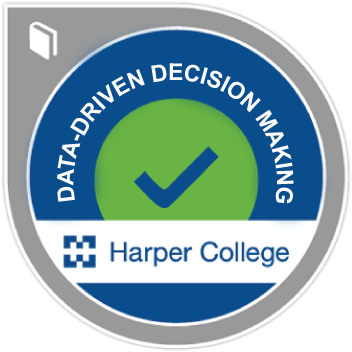 Completers are equipped to understand, use, and analyze data to improve decision making. Using statistical analysis, badge earners demonstrate the key role that data play in improving business processes. Demonstrate understanding of data-driven analysis tools and techniques, without coaching. Demonstrate understanding of the applicability and benefits of using data-driven analysis to improve business processes, without coaching. Attend all eight hours of the course.